when i moved to a new job, i was thrilled to know that plenty of the restaurants that i wanted to try out was within walking distance of my new office. 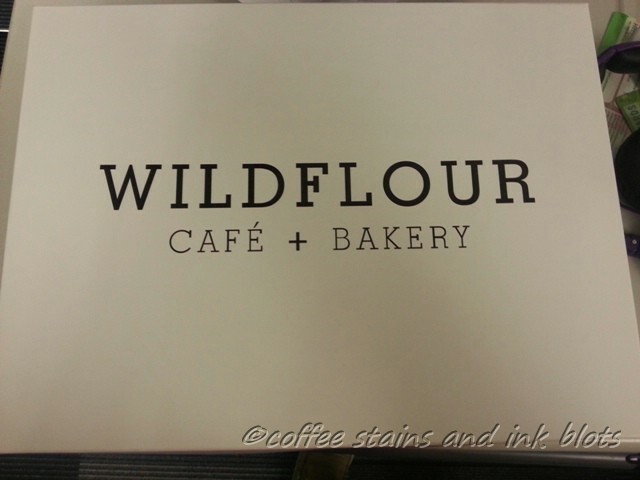 one of them was wildflour cafe + bakery. 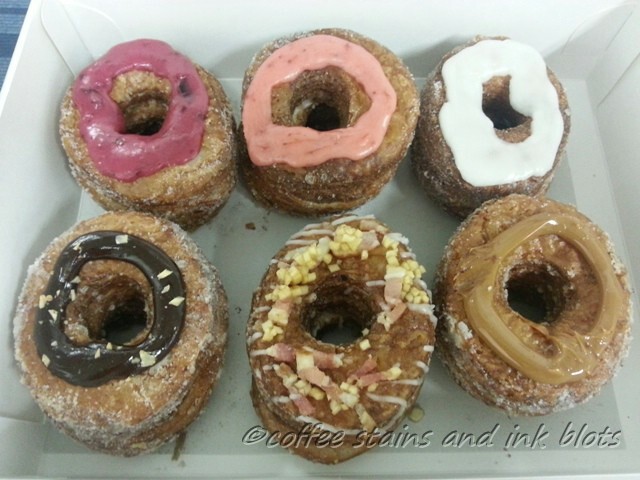 since the cronuts will be saying their goodbyes this coming end of january, i will be posting about them first. i will do another post regarding the meal that i had here. i’ve always wanted to taste the “cronuts” from this bakery since they were the first ones who offered this here in the philippines. so after i got my first paycheck, i bought a box of these treats. the flavors i got were (clockwise from the top): mixed berries, strawberry, vanilla, salted caramel, bacon and chocolate-hazelnut. at php 120.00 per piece, these goodies are priced a little to steep for the average joe. i do not seeing myself buying these regularly. but the size of the cronut somewhat compensates for its price. each piece was around 1.5 inches thick (which made it a little hard to bite it 🙂 ). there is a cream filling in between the layers of the pastry and topped with a glaze which gives it the flavor. the cronuts are also rolled in sugar. of the six cronuts pictured above, i only got to taste the mixed berries, strawberry and the salted caramel. i liked the mixed berries since it had a hint of tang in it courtesy of the berries. my son liked the chocolate-hazelnut and hubby said that the vanilla was pretty good too. it was a bit messy to eat as pieces and crumbs were falling all over when i tried biting into it. so what i did as cut it in half (horizontally) so that it would fit my bite. the only downside is that the lower part did not have any glaze in it. my verdict: it was good and i liked some of the flavors, but it is not something that i would fight someone with for the last piece left. maybe i will try it one more time before they bid adieu. i just hope that as i walk past by the shop, they are available. Sidenote: wildflour’s proper term for this is croissant-donut, since apparently, the term cronut is copyrighted by dominique ansel. during junjun’s post birthday celebration at alabang town center, we bought a box of cello’s donuts, which contained assorted flavors. before, you can only find these donut’s at their shop near De La Salle – Taft. thankfully, people from the south can now get them at ATC. the price for the box is at Php 165.00. The donuts get a little hard though once you have refrigerated them. the flavors were good, but not outstanding. 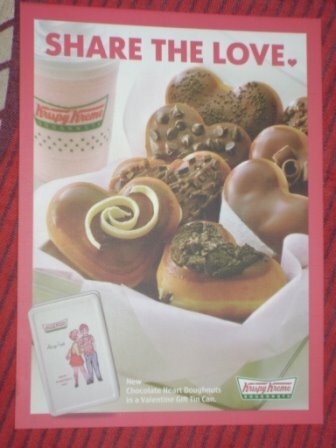 last thursday, we bought the krispy kreme valentine’s doughnut. 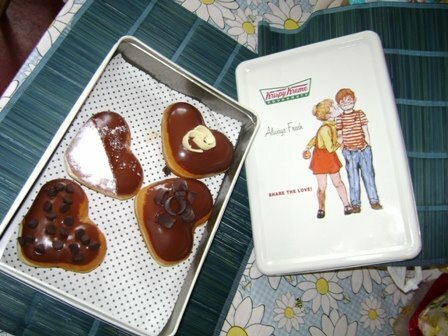 for 300+ pesos, i got 6 heart shaped donuts, and a tin can container. the donuts were good, not too sweet. i specially loved the dark chocolate donut (no longer in the picture because i already ate it before i remembered to take a picture). additional bonus is the tin can. 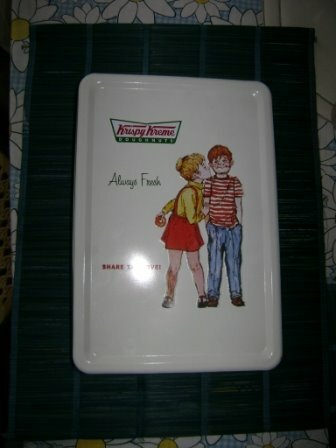 wonder what i will use it for after we consume the donuts. advance happy heart’s day everyone!